Before this change in the law, the reason for divorce could change the settlement outcome – for example an adulterer may have been given a smaller piece of the matrimonial pie. This is no longer the case and in effect when you get divorced in Australia, the court doesn’t take into account the real reason the marriage broke down when deciding on matters around property and children. So how do you legally separate? Well, it’s actually simple – you just tell your partner that you are now separated and that you want a divorce. In the case that you think there may be a dispute in the future on the date of separation, you might want to send an email or letter in addition to telling them in person. You may need to be able to prove in the future the day on which you separated as you need to wait a year before applying for a divorce. If you can’t afford to live in two houses, you may ‘separate under one roof’ which means that you are separated but still live in the same residence. If you are going to do this, you will need to live as if you’re both living alone. You will need to sleep in separate beds, cook your own meals, do your own laundry and so on. Which government departments you have advised of your separation, if any. Any correspondence may be attached to your affidavit to the court. The family law act has a provision for you to live as a married couple with your spouse for up to 3 months after separating and still allows you to include the time before and the time after living together as husband and wife towards calculating the 12 month separation period. This means that if you separate for 5 months and then get back together again for 3 months, then separate again you may count the initial 5 months towards the 12 month time period of separation before applying for a divorce. If you live together again as husband and wife for more than 3 months then you have to start counting from scratch. 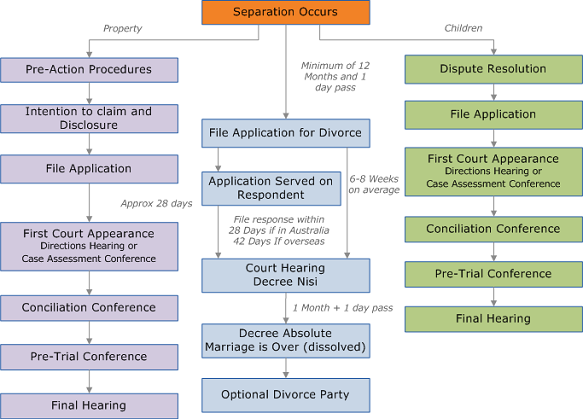 The entire divorce process itself takes a minimum of 15 months. You need to stay separated for 12 months, then make an application and wait for a court date. After the matter has been heard in court, it will take one month to become officially divorced. The process of asset division and working out the contact with your children will depend on how much the relationship with your spouse has deteriorated. If you are still both amicable and on speaking terms you should be able to have everything done and dusted with consent orders in place in 2-4 weeks (depending on the court). If you’re not on speaking terms or there is a large difference between what each of your want out of the separation, then getting to a final hearing will depend on the court and how busy they are. In general however, it will be a minimum of 6 months and more than likely a lot longer (the average is 2.5 years), unless your come to some sort of agreement with your ex spouse. To get an indication of the costs involved with the divorce process, you can read Divorce Costs – How much should you expect to pay?